Whole-bunch (aka whole-cluster) fermentation simply refers to the practice of not destemming grapes. Whole bunches, stems and all, go directly into a fermentation vat. This would have been considered common practice before World War II , as mechanised destemmers were not commonplace. See our graphic in full here. Carbonic maceration specifically refers to anaerobic fermentation (without the presence of oxygen) of whole bunches. 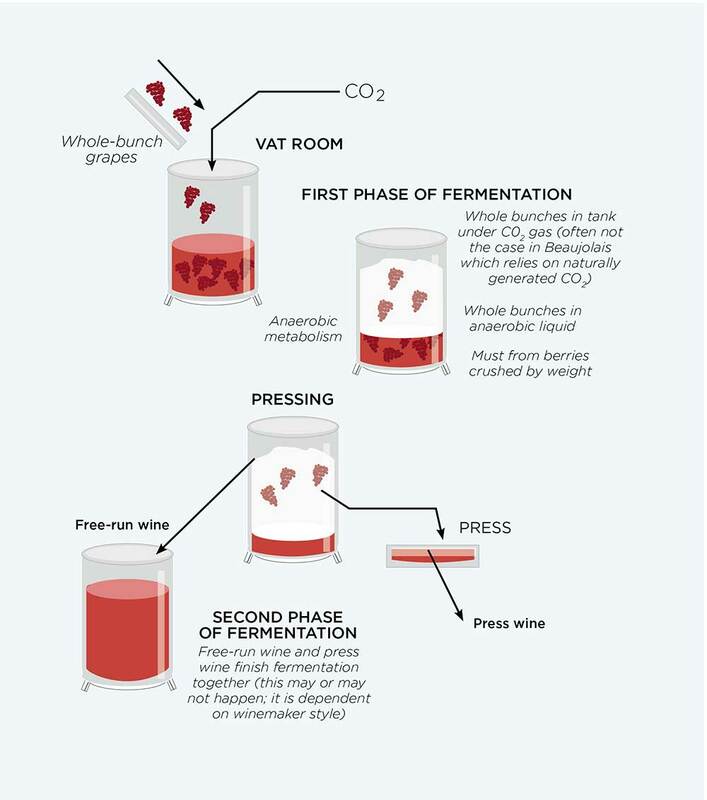 This is achieved by covering the must with carbon dioxide, and completely sealing the fermentation vessel (see diagram above), or as in the Beaujolais method, by relying on the CO2 produced naturally by the ferment. This semi-carbonic maceration achieves a similar effect; however, those berries squashed at the bottom undergo conventional fermentation while intracellular fermentation takes place in the intact berries above. What’s interesting is that the intracellular (anaerobic) fermentation produces completely different aromatics and flavours – typically fresh red berries or even bubblegum – and a very soft texture compared to the standard yeast-driven fermentation of crushed grapes. It’s this flavour profile that has become famous as the Beaujolais style. Beaujolais can certainly claim to be the spiritual home of whole-bunch fermentation. It’s here that these techniques have been used for centuries, as Mathieu Lapierre, winemaker and son of Morgon’s famed Marcel Lapierre, explains: ‘We have evidence that the Romans were using stone vats to do whole-bunch fermentation. I think there’s a reason why this style of winemaking has always been practised in Beaujolais.